What great fun PRESS and MCLA’s Design Students had at Rock the Block yesterday. 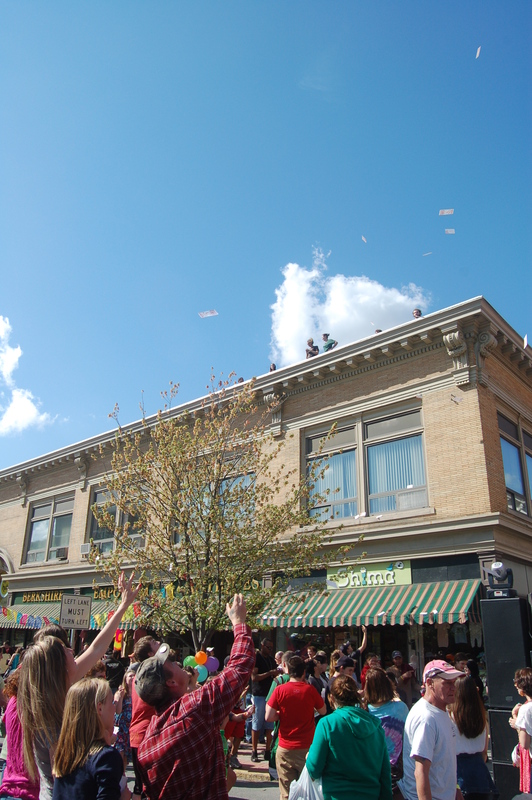 Rock the Block was a street party that MCLA’s Performing Arts Management class produced as a class project. And boy was it fun! We’ve gotta thank the PAM class, Jonathan Secor and the City of North Adams for making it happen. We loved being part of it! Love, money, image, identity, culture, conflict, future. What defines your generation? 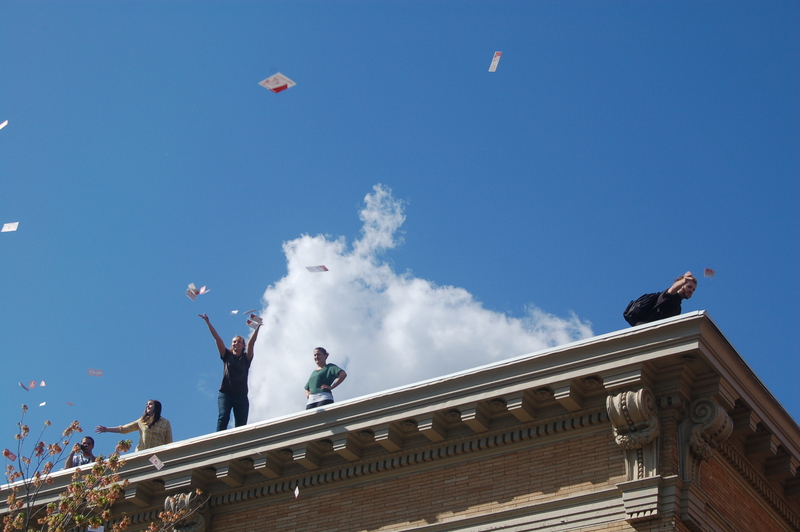 Create a leaflet inspired from leaflet drops used as psychological warfare and political broadsides. Use and transform text from a fortune cookie , add your own drawing and create an image that defines a positive vision of your generation. You’ll then scan the image, adapt it slightly to make a plate to be printed on the Vandercook at PRESS. 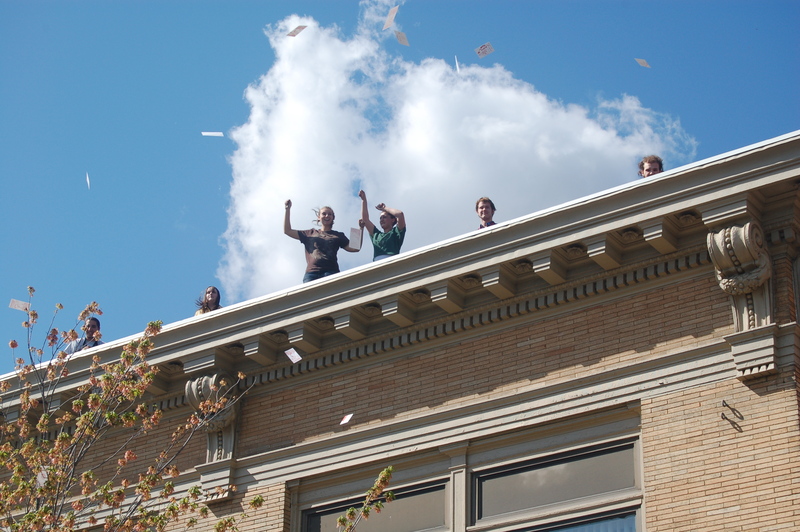 Then at 4 p.m. five of my students, Marli LaGrone, Damian Gordon, Alberto Roman, Stephanie VanBramer and Adriana Alexatos went up to the roof of the building on the corner of Main and Holden and threw the leaflets out to the crowds below. What a fun way to end the semester! 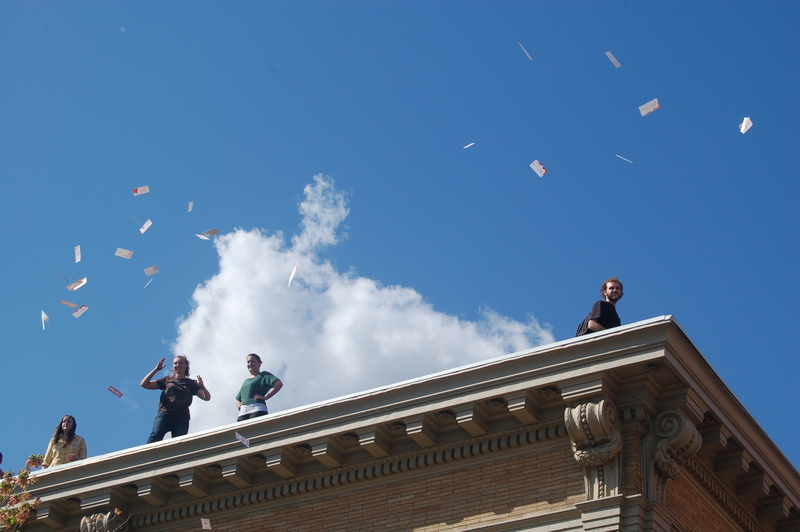 Tags: Downstreet Art, leaflet, letterpress, north adams, paper drop, Printing, vandercook. Bookmark the permalink. Previous post ← Congrats Spring 2012 Graduation Art Majors! This is truly amazing, MCLA printmakers. Way to go!